Authored by Justin Moore (DrChat) on Dec 21 2016, 2:52 AM. "Love" token, awarded by tintwotin. "Love" token, awarded by patnard. "Love" token, awarded by vklidu. "Yellow Medal" token, awarded by looch. "Love" token, awarded by davidmcsween. "Love" token, awarded by pcote. "Love" token, awarded by FraYoshi. "Love" token, awarded by Lucas_Pierru. "Like" token, awarded by Squareys. "Like" token, awarded by oxben. "Mountain of Wealth" token, awarded by januz. "Love" token, awarded by Bawaria. "Love" token, awarded by GuillaumeAmat. "Like" token, awarded by Funkster. "Like" token, awarded by aditiapratama. 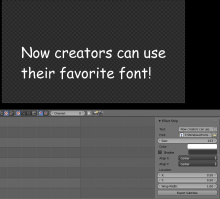 Allows users to select a font for their text strips in the video sequence editor. Justin Moore (DrChat) removed rB Blender as the repository for this revision. Justin Moore (DrChat) marked an inline comment as done. Although we don't have an explicit style rule about this, it's better to not perform assignments during conditionals. Perhaps a slightly more descriptive comment would be useful here? Like "number of users" or something like that? I looked into doing that at first - but those are vector font datablocks which don't have anything to do with BLF fonts. Was gonna add a "sequencer font" datablock but gave up cause I just couldn't figure out how. Justin Moore (DrChat) marked 2 inline comments as done. Guillaume AMAT (GuillaumeAmat) added a subscriber: Guillaume AMAT (GuillaumeAmat). Jonathan Hale (Squareys) added a subscriber: Jonathan Hale (Squareys). @Justin Moore (DrChat) Maybe you need to mark that "duplicate" comment (which I also cannot recognize as such) as "Done" so that the blender maintainers look at it again? Yeah - I'd love to see this in mainline blender. I'm not too sure how to call their attention back to this issue, though. Lucas Pierru (Lucas_Pierru) added a subscriber: Lucas Pierru (Lucas_Pierru). We definitely need that feature ! Is it working on your side ? Could someone help me with this ? I have this patch in my local builds (Fedora) and it works fine. Admittedly my source isn't really up to date, I think it's hovering somewhere close to 2.78c. It's been a while. Well that's surprising since I'm also using build 2.78c as the source. I redownloaded a clean 2.78c source this morning and did all the process again (manually adding the code shown below then compiling) and I still have this "Can't find font: //folder/font.ttf" error. As for now I can't figure what I did wrong. Have you tried specifying an absolute path for the font? Francesco Yoshi Gobbo (FraYoshi) added a subscriber: Francesco Yoshi Gobbo (FraYoshi). 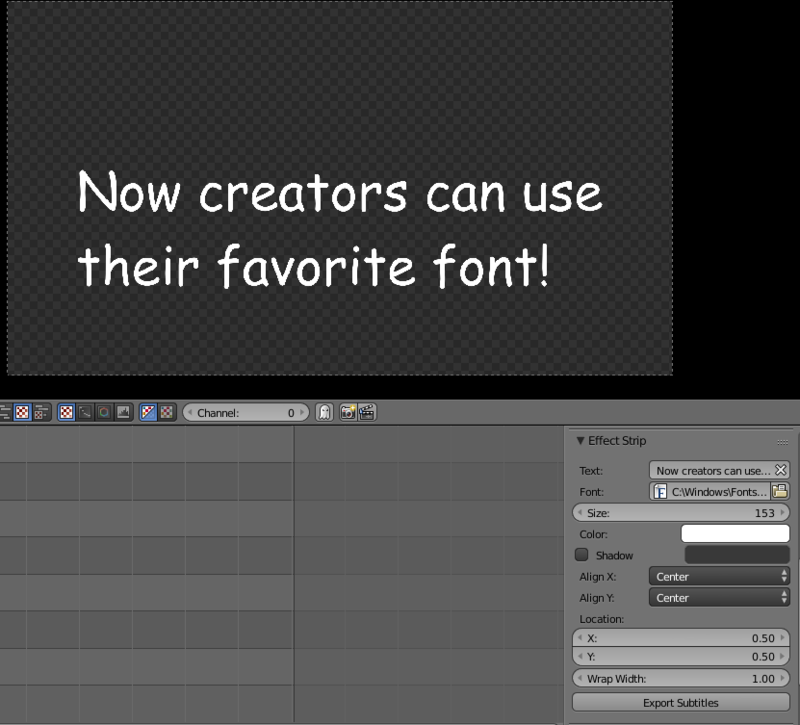 Having the possibility of customizing Font in the Video Editor is mostly welcome. Thanks for working on it! Do you have any time estimate for the release of the current feature? I'm testing 2.79 RC1 at the moment but cannot see this feature. Some questions this patch raises. As Gottfried says, wouldn't it be better to use font data blocks instead of every user having to set the file path? This will become annoying fairly quickly if you ever want to change fonts. BLF_MAX_FONT is currently set to 16, after this patch is applied its likely someone will hit the limit, although it's best to handle this in a separate patch. Prefer patches don't adjust defaults, again below. You're right - font data blocks would be much better. I've looked briefly into using the vector font data block, but as it is now, it doesn't use the BLF API. I'm not experienced enough with blender's code to figure out a good way to add a reference to a BLF font in the vector font data block without help. I made this change because I feel it makes more sense that text effects should default as a centered title. As I understood this, text effects were originally hacked in as temporary subtitles. If you insist though, I can revert these changes. 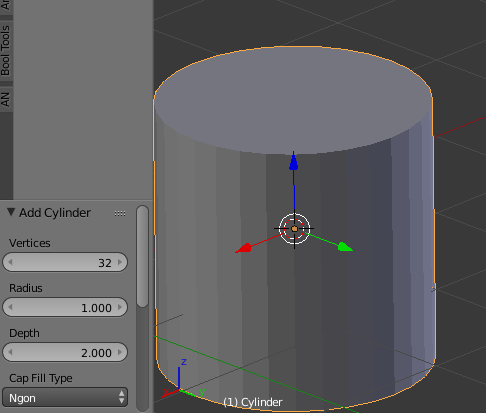 It could be a context toggle like in the viewport, when a new mesh is added. Settings are manteined if changed once.. so the text font, color, position and alignment could stay the same once these are changed at creation time. Using VFont data-blocks for sequencer would mean using the VFont only for it's filepath and still using BLF for rendering. All things considered I think this is better than adding a different kind of font data-block, others devs may want to comment though. Best remove unrelated edits, its trivial to apply as a separate patch later. Campbell Barton (campbellbarton) added a subscriber: Bastien Montagne (mont29). Checked and @Bastien Montagne (mont29) agrees it's best to use re-use VFont data-blocks. How do I increment the refcount for VFont while I'm using it? I've reused the UI template used by curves, but when trying to unlink the font, I'm told that it's being done in an incorrect context (editfont.c:1780). See uses of id_us_plus, for the second question - it looks like font_unlink_exec could be made to work. Need to investigate why UI_context_active_but_prop_get_templateID behaves differently in your case. I'll submit my changes so far without this working. I've implemented refcounting for the font using id_us_plus and id_us_min, but I'm unsure if it's the correct way to go about it. I'll definitely need a second person's opinion on that code. Justin Moore (DrChat) edited edge metadata. Piggybacking off of the VFont datablock instead of string font paths. The ID should be cleared even if the value is NULL. There is no need to load the font here. Just invalidate the ID and allow the sequencer to load when it needs. Also, returning if the font isn't found isn't a good convention, and not done anywhere else in Blender. Just assign the font, if its not able to load, the user can correct the path of the font. Load BLF fonts when required rather than when selected. Still have the issue with unlinking fonts - incorrect context. This comment was removed by Daniel Oakey (doakey3). @Justin Moore (DrChat) I too am anxiously awaiting this feature. How's development coming along? Any chance we'll see this feature in 2.8? When I close and open blend file, VFont reference of text seq data is loaded with old memory address, but VFont block from blend file is loaded to new location. 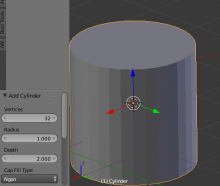 Sometimes on the "old memory address" there is random data, which will cause blender to crash. This should be possible to fix easily, but I don't know how exactly. Incorrect context issue - in file wm_event_system.c in function wm_operator_call_internal() following code changes area of context. I didn't want to spam, so I edited my post. Can you please take a look at suggested modifications? david mcsween (davidmcsween) added a subscriber: david mcsween (davidmcsween). @Richard Antalik (ISS) I would create a new differential as this one has messed up permissions. Unless an admin like @Campbell Barton (campbellbarton) can fix it.